It’s not just humans who enjoy a snack that jiggles and wiggles like gelatin does. To the surprise of scientists, it turns out several penguin species enjoy a bit of jellyfish in addition to their diet of fish, squid, krill and crustaceans. More than 350 hours of video footage from small “penguin cams” in the wild showed that Adélie, yellow-eyed, Magellanic and little penguins eat a wide range of gelatinous critters while hunting for other food. Scientists in five countries attached small cameras about the size of strawberries to the backs of 106 penguins at breeding sites throughout the southern hemisphere. Each camera only recorded one trip out to sea per penguin, but the videos revealed penguins going after gelatinous prey almost 200 times, including 187 jellyfish. Jellyfish are just one type of gelatinous marine animal, but other “gelata” species unrelated to the jellyfish ended up as penguin dinner too. Little and Magellanic penguins gobbled up 11 comb jellies. 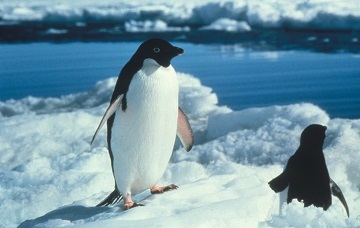 The penguins did not seem interested, however, in salps, which are gelatinous filter feeders that consume phytoplankton. Despite the number of jellyfish consumed, they were not a big part of the penguins’ diet. They made up only about 1-2 percent of total calories the birds ate. Still, with jellyfish populations soaring in recent years, penguins’ affinity for jellyfish may offer an abundant alternative food source when other menu items are scarce. But scientists don’t know whether huge blooms of jellyfish alone would be enough for penguins to survive if other food sources disappeared. Read Science and the SeaTM every month in these publications. Subscribe to our RSS feed for new Science and the SeaTM articles.